Both Ellicott’s and Barnes’ Bible commentary (verse Ezekiel 8:14) state that Tammuz is identified with the greek saviour-god Adonis. B Walkers Encyclopaedia states “Adonis was born in Bethlehem. He was the son of the Virgin Myrrha. He died in Easter time and rose again in periodic cycles. Most religions are worshipping a version of Nimrod, Semiramis, Tammuz. Again these names have many variants, and all derived from the Tower of babel. 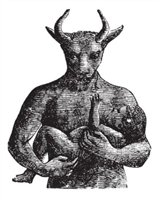 The bible has many examples of this: Nimrod is known as Baal, Baalim. Semiramis is known as Ashtaroth, Queen of heaven etc. 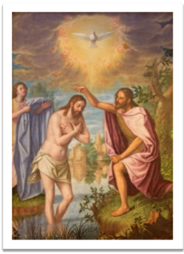 It brings a whole new meaning to the below verses when Jesus was baptised. The section ‘Jesus never met John the Baptist’, offers some proof that the above verses are forgeries. The dove who is supposed to represent the Holy Spirit is actually Semiramis who was the mother of Tammuz (who is represented as Jesus). The Christian Trinity is now understood. 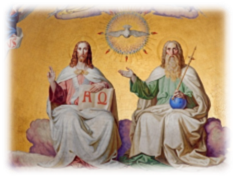 Jesus on the left is actually Tammuz, the dove is Semiramis, the father on the right is Nimrod. That is the origin of the ‘Christian Doctrine of the trinity’.